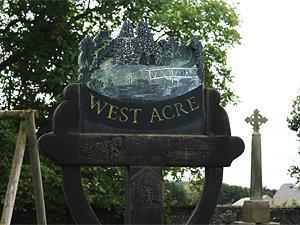 West Acre01553 763044work VillageThe village of West Acre lies 12 miles east of King’s Lynn on the north side of the River Nar in a heavily wooded valley. Close to the village church are the remains of a Priory which was founded for the monks of the Cluniac Order in the 13th century. The current Church of All Saints is located just to the west of the remaining gate house to the priory. The church itself is striking being perpendicular in style. The tower of the church dates from 14th century although much of the church was re-built in the 17th century. The clock face on the tower carries the distinctive message 'Watch and Pray'. West Acre village is on the Nar Valley Way which runs 34 miles from King’s Lynn to the Museum of Rural life at Gressenhall. Much of the River Nar is a river valley Site of Special Scientific Interest. The tranquil village offers a pub, The Stag and is also home to Westacre Theatre which is based in a converted chapel and offers a year-round programme of in-house productions, visiting companies, concerts, workshops and events. To the north of the village is West Acre Gardens, a lovely old walled garden with a nursery and beautiful display gardens. The village of West Acre lies 12 miles east of King’s Lynn on the north side of the River Nar in a heavily wooded valley. Close to the village church are the remains of a Priory which was founded for the monks of the Cluniac Order in the 13th century.